Information we will need to start your family tree - provide as much info as you can. It is important to have names of grandparents or parents who were born before 1940 as well as the state or location where they lived. The following chart can be printed off if desired. 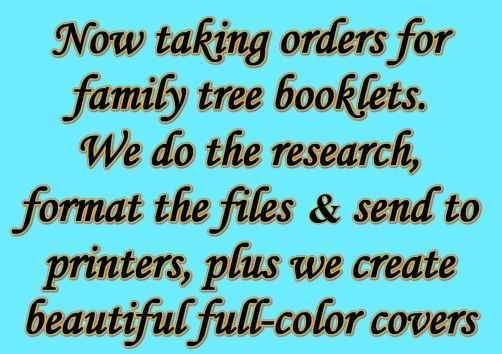 Get in touch with us email: familytreepublications@gmail.com - Check out our work here. Price for research, formatting, printing, plus one copy of your completed booklet is $75 - $100 - depending on page size. Page size depends on how much information we find on your family tree. Additional copies of your booklet can be ordered at any time.